On October 1st and 2nd we observed a total 15 (+) Spoon-billed Sandpiper at the Geum Estuary, along with a further 23,000+ shorebirds. Scanning for SBS. Photo © Hiroshi Tomida/Birds Korea. Although it is now more than a week since the day of our most auspicious observations of the Critically Endangered Eurynorhynchus pygmeus, my eyes can’t help but scan everything in front of them. Fellow researcher Hiroshi Tomida-san first pointed out this ‘phenomenon’ at dinner, as we both unconsciously examined the shoreline of the painting on the wall. From sunrise to sunset, following the tide in and out, our eyes swept through flocks of hundreds, even thousands of birds for one particular species. Taking a stroll. Digiscoped video © Jason Loghry/Birds Korea. At many points throughout our research we found ourselves going to great lengths to get closer to the foraging birds. This was sometimes comical; other times terrifying. Above is footage captured of us slogging our way through some very sketchy treks of tidal flat. Although this work was wearisome at times, the reward was enormous. Eurynorhynchus pygmeus foraging at Geum Estuary. Digiscoped video © Jason Loghry/Birds Korea. Following further analysis of the data, results will be posted online and shared with participants at the Global Flyway Meeting in Seosan, October 17-20, and at the Spoon-billed Sandpiper Task Force meeting in Thailand in mid-November. with a coming cold front,our Spooner monitor in Yangkou,Rudong,Jiangsu,China revealed that the number of Spooner surprisingly keeps on rising from 20+ to 100+ in mid-Oct. I guess some of them are coming from south Korea,or somewhere in China unknown by us. Will report details in the meeting in Thailand.Hope to meet u there. Thank you for this great information. 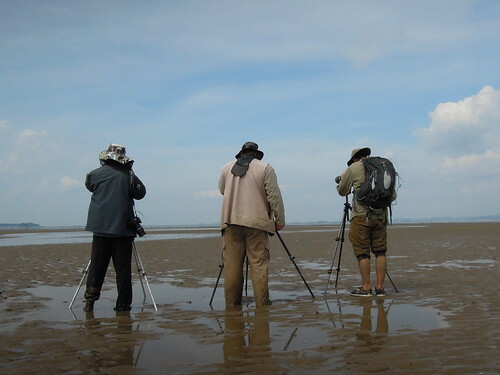 I certainly do intend to be at the meeting in Thailand – so look forward to learning much more from you there about the research on shorebirds along the western shores of the Yellow Sea. There was also one at Namyang Bay in October- the first record for that site. Thanks a lot for this Tim! We’ll make note of it. Do you have a specific date in October? -apparently the same individual was at Namyang bay from at least September 10th – October 10th. Sorry that should read September 12th – October 10th for the Namyang bird. This is good info. Thank you Tim !